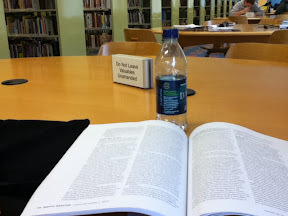 It rained off and on during the day, so on my lunch break I headed out to the Grand Rapids Public Library to do some reading. I finished up an article on happiness in Skeptic magazine which was pretty interesting. When I was done with the article I moved onto the Kindle. Really I just wanted to check out the sync feature. 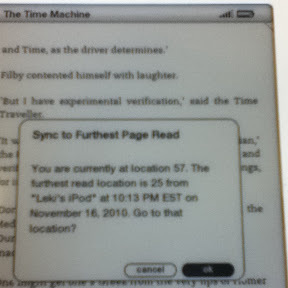 Last night I had started reading HG Well's The Time Machine on my iPod Touch (using the Kindle app) and I made sure to hit he sync button. So when I opened up the book on the Kindle (with the wireless on) it immediately asked me if I wanted to advance to where I had left off last night. That's pretty neat.